I'm relatively new to art and took it up about ten years ago when retirement from being a Science teacher was on the horizon. However it has taken until this year for me to feel that I understand what I'm doing. 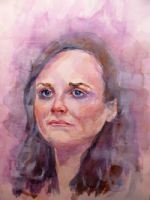 At the moment I'm mainly interested in portraits, and I paint in watercolour. The artists that have influenced my style are Charles Reid, Burt Silverman and Christian Hook.